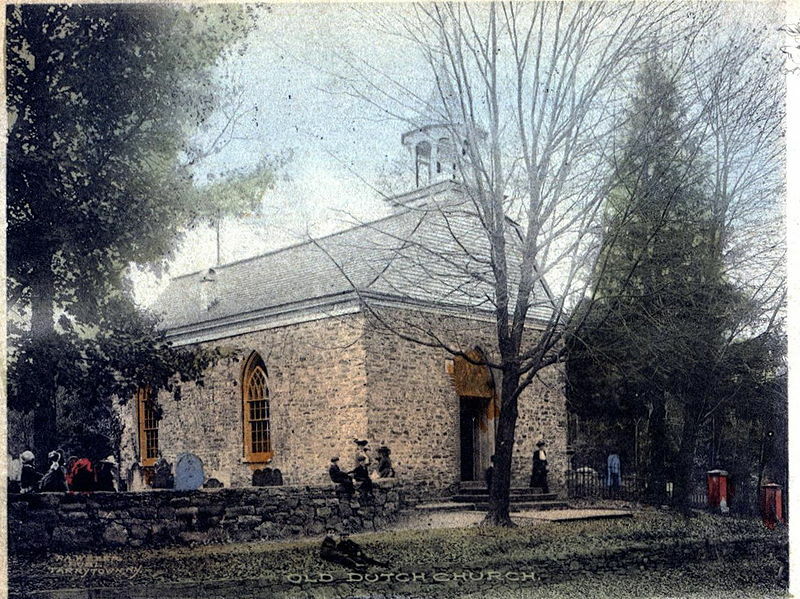 Old Dutch Church in 1907, Sleepy Hollow, NY. Public domain image (PD-1923) courtesy of Wikimedia Commons. When I read The Legend of Sleepy Hollow for my literature classes in school, I thought it was one of the most creepy stories ever written by Washington Irving. I went through it several times, and it’s still creepy, even to this day. Part of it is the enduring mystery of what happens after Ichabod is chased by the Headless Horseman. Did he survive after the Horseman tossed his pumpkin head at him? Was he frightened enough to give up on the town and just go away? Was it really Brom Bones masquerading as the Horseman or was there a real ghost? Washington Irving leaves it up to us to decide. One Sleepy Hollow adaptation I saw (the 1980 version with Jeff Goldblum playing Ichabod, available on YouTube if anybody’s interested) came up with an interesting twist on the story. In this version, there are at least three riders in the forest: Brom Bones pretending to be the Horseman, a friend of Brom Bones who’s in on the act and the real ghost Horseman. I like this version because Ichabod gets the girl and there’s a mysterious twist at the end. So now Ichabod’s making his modern appearance in the TV show version of Sleepy Hollow. He died in the Revolutionary War and had a spell cast on him by his wife/witch Katrina so he could come back to life centuries later. Ichabod teams up with modern police officer Abbie Mills (Nicole Beharie) to solve the ongoing mystery of what’s going on in the town of Sleepy Hollow. I like the show, though. It makes me laugh when I watch poor Ichabod coping with doughnut holes, laptop computers, car door locks, smartphones and other aspects of modern life. There’s also some good one-liners in it, the mysterious atmosphere of the original story and crimes to be solved. Are they going to reinvent Ichabod again in the future? I’m not sure what else they can do with him, except put him in space. However, that could prove to be a challenge for the Headless Horseman during chase scenes. I wonder what Washington Irving would think. Irving was one of the first international bestselling American authors, did his best to get writing recognized as a profession and was a strong advocate for copyrights. Maybe he’d like how different writers have developed his Ichabod character. Hmmmmm.